Black Mountain Lodge and Playhouse offers premium lodging in Red River, New Mexico as well as family entertainment at the legendary "Playhouse". 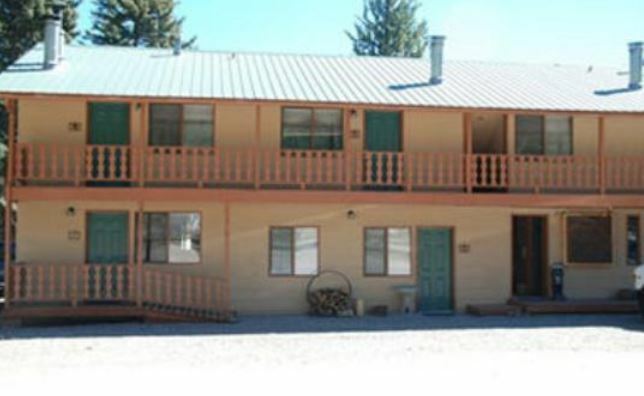 Located at the base of Red River, New Mexico ski area, enjoy ski-in/ski-out Red River Lodging Condo units! Come stay! Come play! Let the adventure begin! Welcome to Black Mountain Lodge and Playhouse, conveniently located at the base of the Red River New Mexico ski area next to the main parking lot, Magic Carpet Ride, and Chalet Warming house; two blocks from Main Street. We offer affordable Red River lodging rentals for Red River, New Mexico with ski-in/ski-out accommodations (as well as bike-in/bike-out, jeep-in / jeep-out). Black Mountain Lodge and Playhouse is located at the edge of the Carson National Forest's 86,000 acres, providing our guests comfortable accommodations in Red River, New Mexico with direct access to the many activities offered in our great community. Pioneer creek runs beside our facility making fishing easily accessible, as you can easily watch your children fish from the comfort of your room. This, of course is only one place to fish for trout, salmon and other resident species, since the Red River is only two blocks from your front door. The community of Red River, New Mexico is situated at the base of the Santa de Christo mountain range placing hiking, ATV riding, skiing, boarding, horseback riding, jeeping, or snowmobiling right outside your room. After the days' activities, unwind in the Black Mountain Chophouse and Tavern (opening in Sept 2011) while the kids play in the 15,000 square foot Playhouse. Enjoy the "big game or race" on one of our six flat screen TV's turned to sports centers. Bring your kids to be entertained while you relax! The Playhouse is a complete, one stop hot-spot for total children entertainment...with video games, a skating rink, 18 hole putt-putt golf, pool tables, foosball, and air hockey! The young (and young at heart) will enjoy hours of entertainment (come check out some of our retro games like Gallaga, PacMan, and Ms PacMan). Parents can unwind by the fire-place and enjoy Texas style BBQ, friends, family and the amazing atmosphere of Red River. The Lodge offers a large, ground level deck with three bar-b-q pits for guests use. Be sure to check out our specials for romantic escapes, honeymoons, family gatherings, and adventure packages. If you would like to book tours, rentals, or plan meal reservations, we will be happy to assist you with any of your adventure accommodations including having your ski tickets ready upon your arrival, you dining reservations made, or just to provide suggestions or directions to the many activities offered in the Red River area. Red River is well known as the "Ski Town of the Southwest." It originated as an old mining town before becoming the popular tourist destination it is today. Red River offers warm, friendly faces, kind hospitality, and good wholesome family fun. As a premier New Mexico destination, it is a community that you will love so much; you won't want to go home.... And so, we didn't! We visited Red River Ski area in December of 2010 to enjoy Christmas and New Years in the mountains. Instantly, we were captured by the community, the friendly people, the charm, and the breath taking beauty of the this hidden jewel, nested in the mountains far away from the bustle and hurry of the corporate world. We went to work negotiating our purchase of Black Mountain Lodge. In the process we learned much about the amazing history of Red River and the Black Mountain Lodge and Playhouse. It is our personal desire to see that your experience at Red River is as wonderful as ours! Families have been making lasting memories at the Playhouse since 1964...and it's a tradition we aim to continue. As a part of our extended family, we welcome you to Red River...to an amazing experience...and to the Black Mountain Lodge and Playhouse... a family tradition!